Do girls and women have special nutritional requirements during their years of menstruation? A balanced diet is essential for proper growth, development and functioning of the body and this remains true even during the years of menstruation. A balanced diet containing lots of fresh fruits and vegetables should be taken. Consuming a diet rich in Iron is extremely important. Iron is required by the body to make haemoglobin, an important component of blood. During the years of menstruation, body's requirement for iron increases as it needs to create more blood to make up for the loss of blood during menstruation. A deficiency of iron in the body can cause anaemia. Some of the food products rich in iron are: lean red meat, dark poultry, lentils, spinach, almonds and iron fortified cereals. Citrus fruits or vegetables should be consumed before taking iron rich food. Caffeine and tannin rich food like coffee and caffeinated drinks should be avoided as they decrease absorption of iron. 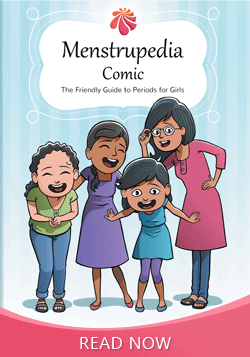 How can a girl or a woman stay prepared for her menstruation on a regular basis?